This is a fanedit of Halloween: Resurrection, trimmed to an improved horror experience and set to fit to pauley79’s Halloween trilogy. Conceptual improvements/advancements of edit over original: In 1998 Moustapha Akkad wanted to make a new Halloween movie. But the question was how do you do something new and something that wasn’t done in the last set of movies? What do you do? You restart the series… Halloween: H20 was a way of restarting the series. Picking up after Halloween II and bring back Jamie Lee Curtis. 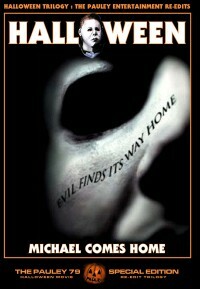 Then came Halloween: Resurrection! Picking up after Halloween: H20. Wanted to make a true Halloween Trilogy. Using only the movies, Halloween, Halloween II, Halloween: H20, and Halloween: Resurrection have created three movies that fit prefectly into a Trilogy.